Although installing wooden posts into the ground takes a little effort, when you consider the weight of the gates being hung off them it is essential that this job is carried out in the correct manner. As such, please read the below information designed to make the job less daunting or complicated. Keeping this mark as the centre line, dig a hole for each post approx 2-4 ft deep depending upon ground conditions. Each hole should be approx 2-3ft in diameter so as to enable plenty of concrete to be placed into it to help secure them in place. Once the holes have been dug, you can mix some concrete ready for the next step. Place the first post into the hole ensuring it is sitting in the correct position. Carefully place some concrete around the base making sure you do not disturb the location of the post. Hold in an upright position as best you can (adjustments will need to be made) and fill the hole to approx ¾ full with the remaining concrete. Once enough concrete is in place you can start the process of plumbing the post up. Check both face of the post to ensure it is sitting vertically otherwise problems may arise when it comes to fitting the gates. At this point you can add temporary supports to the post to make sure it stays in the required position. Repeat the process with the remaining post making sure they are at the right distance apart to allow the gates to fit correctly. Don’t forget you will also need to level the posts with each other across the width of the opening. Leave the concrete to harden for a few days before attempting to install the gates. 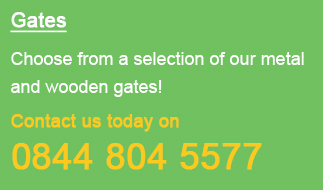 It is essential that wooden posts are set the correct distance apart otherwise your new gates will not fit properly. The below example show the required distances apart making an allowance for the gate, posts and opening tolerances. For more information please see the measuring guide page. Double Wooden Gates Example - 8ft gates fitted to 2 x 4" timber posts, will require a total space of 8ft 9 1/2" (width of 2 x posts, the width of the gate and an extra 1 1/2" for the hinges and latch) to be installed correctly. 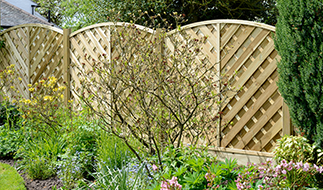 Single Wooden Gate Example - A 4ft wide gate fitted to 2 x 3" timber posts, will require a total space of 4ft 6 1/2" (width of 2 x posts, the width of the gate and an extra 1/2" for the hinges and latch) to be installed correctly.